MedusaFoto is owned and run by Ann Karin Matberg, who lives on the island of Hitra in Sør-Trøndelag, Norway. All her life, she has been fascinated by life under water. Her parents had a caravan by the sea in Lauvsnes, where most weekends and vacations were spent. Ann Karin walked on the rocky beach, hung over the boat’s gunwale or sat with her nose off the edge of the pier every available moment of her childhood. She started diving in 1995, but it took her 14 years before she brought a camera along under water. But after her first trip to the Maldives with her compact camera, she has barely been in the water without one! Her photographs are not only taken under water. “The near things” have also been given lots of attention, both in the form of photography of nature, and in connection with weddings and portraits. Different jobs demand different things, something which develops both the working process and creativity. Doing presentations is what´s closest to her heart – trying to raise awareness of all the life forms we find under water, and that we need to take care of the sea while it is still time. Olympus Norway has picked her as their only ambassador with underwater photography as specialty. 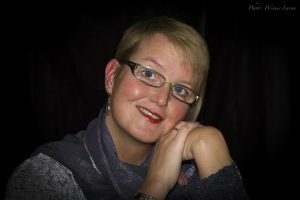 Olympus Europe has given her status as Olympus Visionary – she was the second Norwegian photographer that got this honor. She has also been a part of the development of the underwater housing for the EM1 Mark II camera. Ann Karin is also a proud ambassador for Fotografit, that helps her with every aspect of underwater photography and equipment that Olympus isn´t covering. She has gained notoriety for her underwater photographs, both nationally and internationally. During the Norwegian Championship in underwater photography she won silver in Macro category in 2017. In 2016 she won the first round, and got on the podium twice during the final. 2015 also resulted in two podiums, and she was named the country’s best female underwater photographer. As a part of Team Norway in the international competition Unterwasser Visions she has earned several Top 10 finishes, and has been twice on the podium. Being the main underwater photographer on the Norwegian Nature Photo Festival in Ski in march 2018 was a great honor. She has also had several photo exhibitions, and lectures on underwater photography around the country. 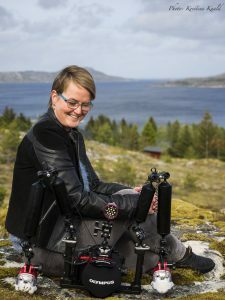 For several years, Ann Karin has regularly contributed to the magazine Dykking (Diving), and the Hitra-Frøya newspaper. Her photographs adorn the aquaculture exhibition of the Coastal Museum in Sør-Trøndelag, and her pictures are often used by the interior architect Landevaag interiørdesign AS. Due to a body that, since 2005, has been severely affected by ME, every moment she can spend with the camera is important, be it above or under water. She simply loves working with her camera, both to capture new moments on her memory card, and to observe life above and under water. It is not least important for her to spread knowledge about, and the joy of, the amazing underwater world that we have, both here at home and in warmer waters. Do you like the work she has done? The photographs are for sale, and Ann Karin accepts jobs both over and under water. Contact her for a chat and an estimate.